EM Slice wireless simulations are used to model the propagation characteristics and performance of new and revolutionary wireless technologies, contributing to the design & evolution of 5G & other wireless communication systems. This is applied to (among other things) millimetre wave (mmWave) channel modelling at frequencies of 20, 60, 80, 120, 300 GHz or higher. These mechanisms can be applied to wireless communications at frequencies in the 2.4 & 5GHz ranges, as well as into the millimetre wave frequencies and higher. This generated data is exported from EM Slice and imported into a spreadsheet or other post processing or data manipulation tool for further analysis. If you are interested in wireless channel modelling, new wireless technologies including 5G, milimetre wave (mmWave) and other systems, please contact us at enquiries@emslice.com to discuss further. 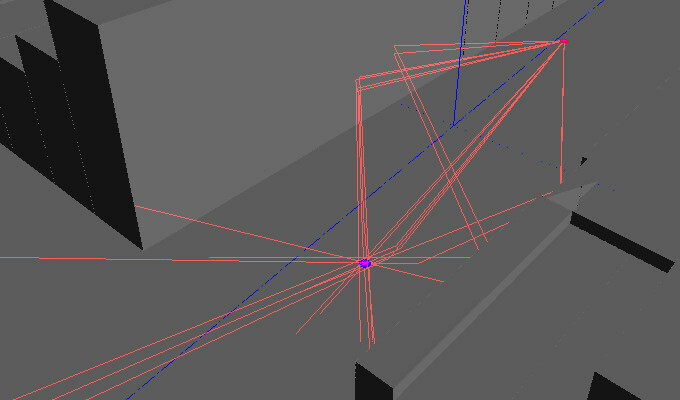 This is a demonstration of EM SLICE simulating the multipath nature of a 3d urban environment. 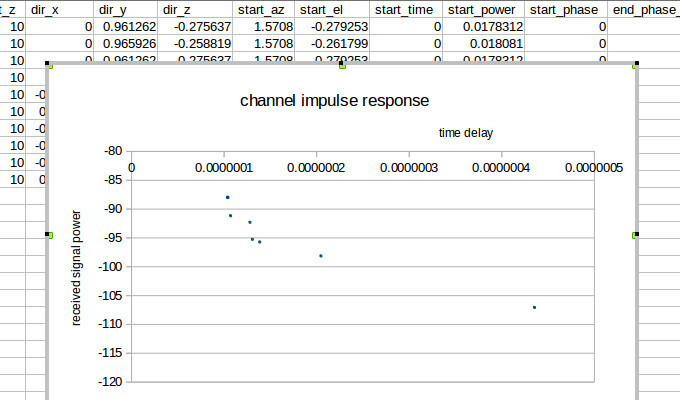 This is the calculated impulse response exported from the channel simulation above.